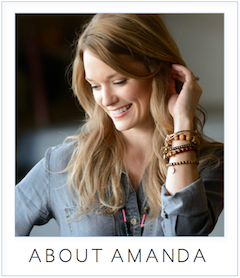 amanda mcclements & metrocurean: Ramps: They're Baaack! Spring ramps from the Dupont Circle FreshFarm Market. For locavores in our area, there are a few fleeting foods that herald the arrival of early spring: morels and ramps. So what is a ramp, anyway? It's a pungent and petite member of the onion family that grows wild in the eastern part of the country. Their short season and urban scarcity make the stinky little guys a covetable item. Any given Sunday at the Dupont FreshFarm Market this time of year, word spreads on who's got the goods, and the early birds typically snap up the supply. Early bird I am not, but I managed to score a bunch this weekend and mixed up a batch of these buttermilk ramp biscuits from Bon Appétit. They fell a little flat (do I have a black biscuit thumb??) but the earthy, assertive onion added amazing flavor. I've also sauteed ramps and served them with pasta. 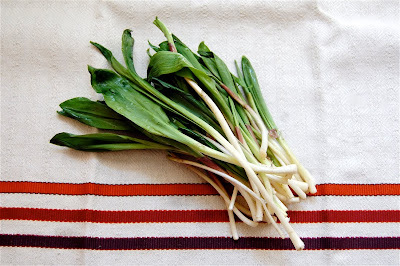 So, Metrocurean braintrust, tell us what you do with ramps? What's the best way to showcase their unique flavor? I do not get the rage over ramps, so I am curious to read what everyone does with them. I know first sign of spring and all that. In my mind, they cost way too much at the DuPont market for what they contribute in terms of flavor (Same for Morels incidentally). If I wait for garlic scape, which is usually pretty cheap, I can make any ramp recipe. First of all, i LOVE the towel in your pic -- where's it from? Second, I made some amazing scones last night with a few of the ramps I picked up at Dupont yesterday. Added Appenzeller and Parmesan -- so so good. I also picked up some ramps at Dupont yesterday! I made a tart with ramps, pea shoots and mushrooms with goat cheese. It tasted like spring. Rivka - I know, don't you love it? It's actually an Yves Delorme napkin I scored for cheap on onekingslane.com. They're gorgeous. I made some homemade mayonnaise yesterday and regretted not having bought some ramps at the market that morning to add finely chopped into it! @amanda Yep, used puff pastry. It's a nice shortcut. Just kinda sauteed everything than baked on top of goat cheese and herbs mixed with an egg. Pickled ramps! I have a friend in Chicago who shared his recipe for duck egg pasta w/poached chicken, pickled ramps & pesto. Sounds exotic almost but it is delicious. He's kindly letting me include the recipe in my pasta book. Gotta get to the market this weekend & pick some up. I made the buttermilk biscuits tonight, but killed the coriander and threw in some grated asiago. YUM! Between the two of us, we're down to two left! It seems one jumps in your mouth every time you walk by the kitchen. At Taste of the Nation last night Charlie Palmer Steak was serving a beef short rib with pickled ramp, and it was phenomenal! Haven't ventured beyond tasting them in restaurants to cook using them myself though! domenica - Let me know how it turns out and congrats on the book! Jim - so glad you made the biscuits! Kim - I missed that dish. I was too busy yapping away to hit every booth. Glad to hear you spotted some ramps. Sounds good. I was having trouble pinpointing exactly why I love ramps, and then I realized: they have all the best qualities of leeks, garlic, and onions all in one little package. Yum. Josh- Great fiddlehead pic! I've been seeing them at Whole Foods but they're from Oregon ... did you find local ones last year? @Amanda- They were indeed from the WF monster. They used to stock loose ferns...now in addition to carting them in from Oregon, we get additional packaging, too. Suppose this happens because loose rare ingredients often wind up in customer's bags w/o being charged properly (or at all! ): major disincentive to stock unique ingredients. Not sure how many ferns grow around these parts...I know the grow in the NE and the NW, but not sure about mid-atlantic. Ris has a great ramp pasta dish on the menu - she cleverly made the ramps cut to look like the bucatini. I simply grill them and dip them in romesco sauce - spanish style. Grilled and eaten with steak or chopped and added to hamburgers! First year in a few thatw e have not made teh trek to Elkins, WV for the ramp cook-off. We would usually buy 5 pounds or so to bring back. I assume Dupont FM is a bit more expensive. Holy crap, those biscuits are amazing! I made 'em tonight with ramps from yesterday's Dupont market and served 'em with local asparagus and some cornmeal-crusted trout. The biscuits, with their buttery, rampy goodness reminded me of eating the garlicky, parsley-laden butter from escargot...but without the parsley, snails, or funny-looking shell holders. Dog walker - grilled sounds great. May try this weeekend. jburka - So glad you made the biscuits! Isn't there some meaty, earthy quality in that flavor that's hard to pin down? I like the snail butter comparison.